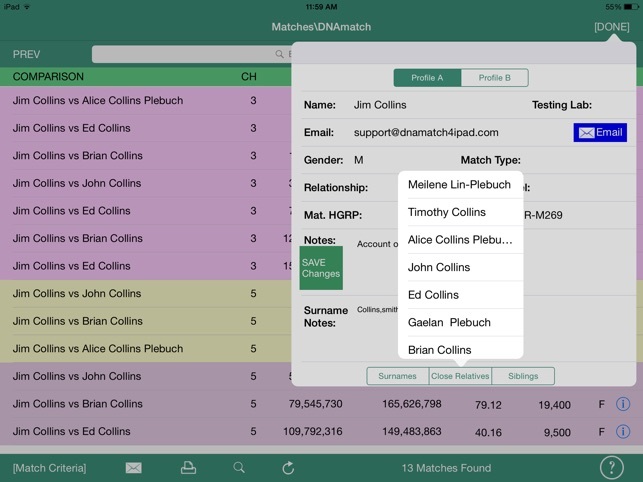 DNAMatch for the iPad is a powerful and easy to use alternative to the use of conventional spreadsheets for the querying and browsing of autosomal DNA data. Autosomal DNA data is frequently used by families who are searching for lost family members, adoptees who are searching for their birth parents and genealogists constructing family histories. 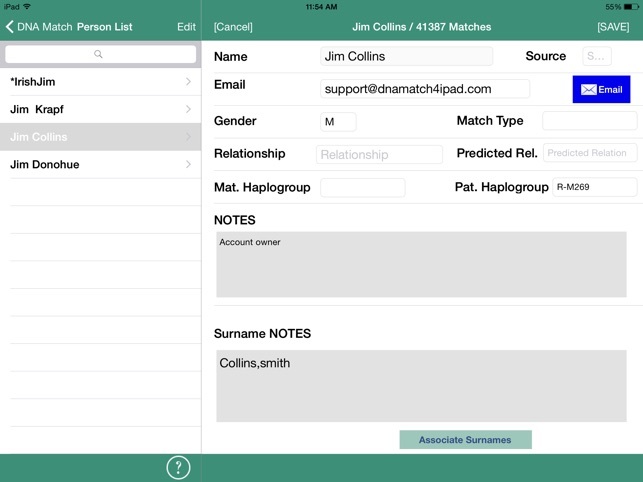 DNAMatch for the iPad imports the CSV comparison files from the 23andMe Family Inheritance: Advance tool and the FTDNA Chromosome Browser tool. Profile data from both of these testing agencies is also imported. 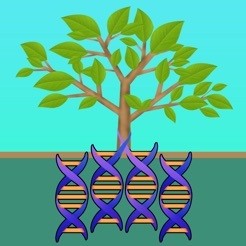 DNA testing companies such as 23ANDME and FTDNA provide their customers with downloadable DNA comparison match data and profile information in the form of CSV files. This is the data that DNAMatch for the iPad imports into its advance database. The DNAMatch database facilitates the establishment of associations within the test results that can be searched with its highly flexible and easy to use query browsing capability. Data mining of your DNA matches is brought to new levels with DNAMatch. * Your data is mobile and not tied to your desktop - take it to client consultations, data mine in your spare time. IMPORTANT - BEFORE YOU BUY. 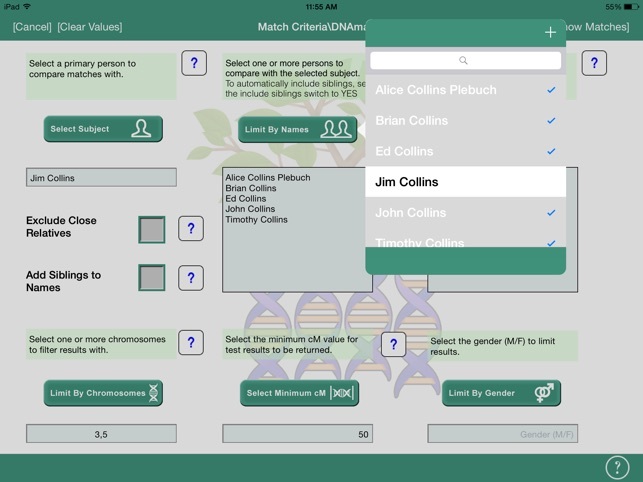 DNAMatch for the Pad uses the Autosomal DNA match files generated by the 23andMe Family Inheritance:Advance tool and the FTDNA Chromosome Browser tool. If you do not know what these tools are and do not have an understanding of how to use the data that they generate, you should not purchase this product. Fix for change in format of the cM field in the 23andMe Aggregated CSV file which prevents the file from being imported. DNAmatch4iPad works great! It was really hard for me to maintain a worksheet of my 23andMe and FTDNA matches. Now I can finally do it in one step! At first I was confused about how it worked, but then I read the instructions and was amazed how easy it was to use, so read the instructions first. This app has rapidly become the core of my genetic search. It's so nice to always have my matches with me on my iPad mini. I'm not sure about the other reviewer's experience, but when I followed the detailed instructions, I had no trouble downloading data from both FTDNA and 23andMe. Creating a report of overlapping segments that can be emailed to others is easy, too — no more cutting and pasting. I strongly recommend this app for anyone looking for a common ancestor. Data management is a pain if you have a lot of matches. Would be helpful if app had a standard spreadsheet/csv format for importing additional data fields to ease maintenance. Has potential but I'm sticking to a cloud-based spreadsheet because of the flexibility and the times when using a laptop or desktop is much faster than an iPad. A real drawback to maintain this kind of detail when it is only available on that device. Maybe some kind of import/export feature would help. This is one of the best APP's that works as advertised. Very useful, flexible and forgiving (when instructions are followed). 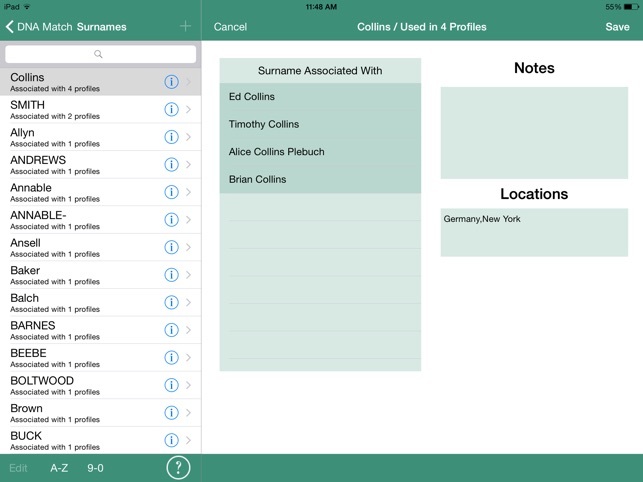 I could not be happier and would not consider any other App of it’s kind, if it exists…. Well written and thought out. I look forward to any APPs in the future this author may invent.